Bullying is something that I've noticed everywhere in different environments, always against classmates and kids of all ages. Ever since I was young, I've been a victim of bullying in 3/4th grade the most (Nestor), where I was pitted against my best friends and berated down for my beliefs and how I acted towards others. I was always told that I wasn't the "best looking" or I was always "too nice" to others, when I was always taught to be humble by my parents. I've shared similar experiences to other victims of bullying, felt the same emotions they did and been in the same situations they have. Something that I've noticed that I share with some bullying victims as well, is the face that I never felt comftorable enough to ask for help. That's one of the reasons that I chose this to be my topic. By spreading awareness, I am giving students and friends a place where they can feel comftorable asking for help without feeling embarrassed. By doing this, I'm able to show that it's okay to speak up if you're being bullied, anytime and anywhere. My zine is unfinished because, to me, it was really hard to find pictures, words, to symbolize Bullying and promote the problem. I was trying to find pictures that showed people in pain, anger, ignoring others, eyes to symbolize that people tend to judge a lot, etc. 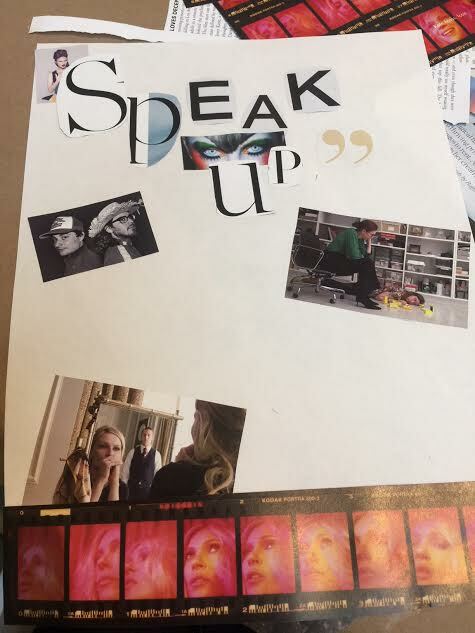 The words "Speak Up" symbolize the title of my presentation and what everyone should be doing. Not only does this apply to bullying, this can apply to any topic surrounded with people getting hurt, abuse, etc. I wanted the words to stand out so people know that it was important to talk about it and that people should feel safe coming forward if they've experienced bullying before. I created this zine at the Museum of Contemporary Art in San Diego when we had the first workshop with them. In this workshop, we created the first draft of our zines and what we were thinking of in the beginning. It showed us that simple images or words (or even letters) can make anything and represent anything you'd like. ​This has helped me because not only is bullying a tough subject to talk and represent through magazines, but it's something that we all need to be aware of. Even though our school is a very open environment, we need to be aware that this can still happen here, no matter the culture where we are. It doesn't matter the environment that we find ourselves in, because this can happen at anytime and anywhere.